Sacramento Roller Derby has an amazing group of sponsors and partners that help to make our events possible. We encourage our fans to support their businesses! Interested in becoming a sponsor? Download 2019 Sponsorship Package Information or contact the Sponsorship Coordinator for details. 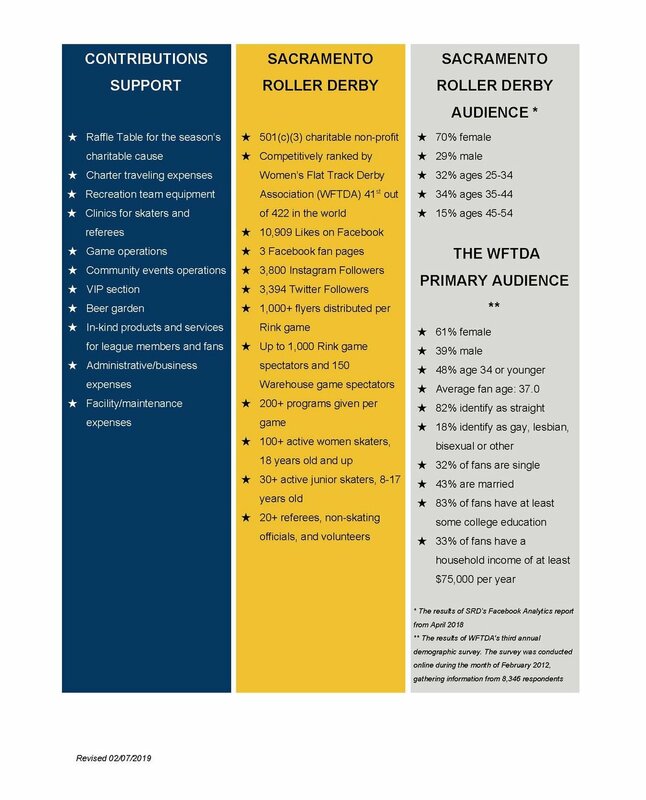 Sacramento Roller Derby is a 501(c)(3) charitable organization dedicated to the empowerment of youths, women, and the Sacramento community through acts of philanthropy and volunteerism, participation in public events and entertainment and by fostering athletic competition and comraderie in the sport of flat track roller derby at local, national and international levels. If you would like to create your own sponsorship package or modify one of the available sponsorship package above, contact Sponsorship Coordinator.